You are, and so is every single person on the planet, Divine. This Divinity is stored inside of every cell of your body, waiting to be utilized. Each person can choose to ignore their innate Divinity, or to nurture and grow it. By walking on your spiritual path, you are already making the choice to utilize your Divine Essence. One of the testing processes that you will have to encounter on this pathway is related to doubt. As you gain confidence in your abilities and start have breakthrough moments, there will be a time when you start to notice your hidden doubt causes you to question what is going on around you. This is completely natural, and a great way for you to understand your own discernment. Discernment is absolutely necessary to move beyond a certain point on your path. However, what is not necessary is doubt. At this time of learning discernment, you will also be faced with people, whom I will term “Doubt-seeders.” This process of doubt-seeding is not malicious or even purposeful much of the time. But, it is an energetic dynamic you would want to be cautious around. If there is someone in your life, a friend, family member, teacher, colleague, etc., who is sharing messages/guidance that causes you to doubt yourself, then this is simply your sign to be mindful of what is being said and how it makes you feel. Doubt is the way of the Ego, and along with pride, it is one of the Ego’s biggest tools to stop your spiritual development process. 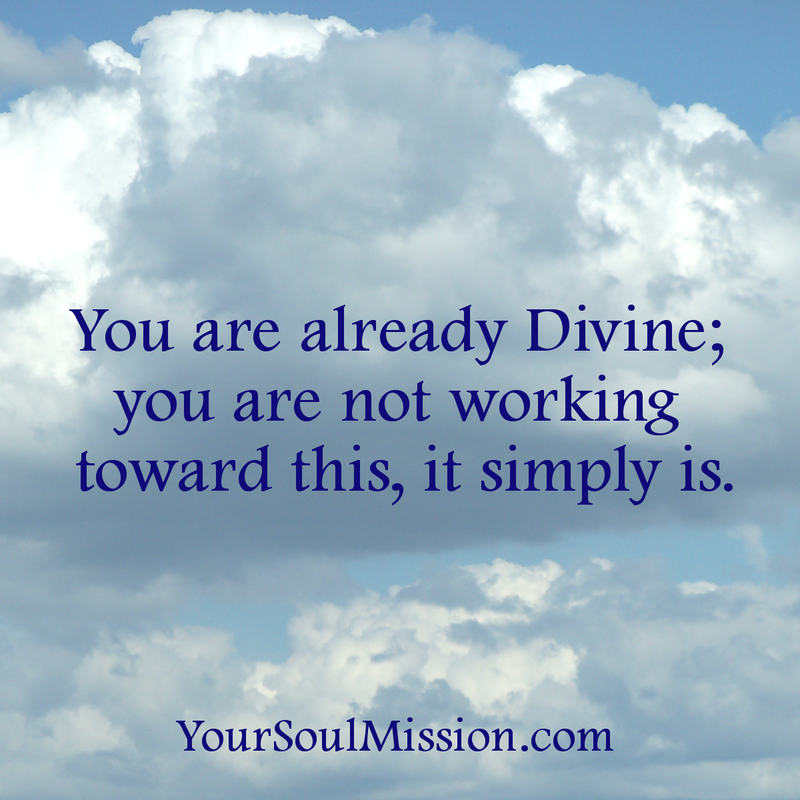 Remember, you are already Divine, you are not working toward this, it simply is. However, doubt-seeders will cause you to question yourself, and cause you to question what you know to be true for you. Doubt-seeders may or may not have direct contact with you, this doubt-seeding can also come down through a pipeline of communication (Gossip, through a third party relaying a conversation, etc.). If you can look at the doubt-seeders from the perspective of your Divinity, you will see that they are playing a role, and that role is to assist you in removing all of the doubt from your system. For, when you no longer react to what has been said to you or about you, then you have completed this lesson of doubt. However, if you are finding that after such a discussion or conversation with someone, that you are left doubting yourself, or left doubting another person, AND you feel that doubt takes you to a place of confusion, anger, fear of moving forward or something similar, then this is your signal that you have just connected with a doubt-seeder. Once you know that, you can begin to shift back toward trusting in yourself and your own Divinity. The spiritual landscape is changing, and has been for many years now. Sure, we still need to practice discernment and to monitor our energy fields, that will not change any time soon. However, if you are in a state of worry, fear, anger, mistrust, confusion or other such emotion after a conversation with another person, then you are in the midst of this lesson about doubt. Examine the situation with love, ask your heart how it can best release this energy of doubt, and then thank the doubt-seeders in your life for helping you with this grand spiritual test. If allowed (by you) to grow in your etheric body, doubt becomes an anchor, anchoring you in the energy you so badly wish to transcend, and also anchoring in your auric field attachments from the doubt-seeders around you. For if you allow a doubt-seeder to influence your truth, it is no longer you who has the power to make decisions in your life, as you have subconsciously given your power away to them. Only you can discern if this is happening (or has happened) to you; by Universal law, no one is permitted to tell you what to do (or not do), or who to work with (or not work with). In fact, if someone is telling you such things, they are not only playing this role of doubt-seeder, they are also accruing a heavy energetic debt for themselves. You are here to learn about YOUR Divinity, and YOUR heart energy. You are here to learn about YOUR Divinity, YOUR heart energy, YOUR love that you share with yourself and others. No one else has the power to tell you how to think, who to connect with, or what to believe, and if any one does so, energetically thank them for their role as a doubt-seeder and send them unconditional love from your heart. It will change the energy of that situation, and assist you greatly in passing a very important lesson along your own spiritual path. choices for me instead of passively waiting on them to evolve. Thank you Karen, your message is divine intervention, recieved at just the perfect moment, to remind me, that I am not less than, and can quietly know, that I have the power to BE powerful, and not doubt myself on any level! and also, how to notice these emotions, for what they truly are! Tests! Interesting topic. I am wondering if you might comment on another scenario. For example, a couple are in conversation: one of then (person A) expresses ideas and things they would like to develop (new work, a calling, or the like of soul significance). The other (person B) chimes in with encouragement. A week or month or so later, person A laments they are discouraged they are still in a rut. Person B recollects the wonderful ideas they expressed one time. The person A doubts that. The statement by person A comes up again. person B, again, recollects the ideas. Person A, this time, refutes the statement, stating (or discerning) how they could not possibly do that, that they are not capable. The second person draws back, and says, “ok, i understand”. This seems to apply to the same terms, but different interpretation. How would you view this scenario and the method through it? Thank you for your thoughtful comment! The situation you described is an example of person A doubting himself/herself. In this case, that doubt is internal, and is there as a result of such factors, such as personal past life history, childhood experiences, etc. The article on doubt-seeders refers to outside persons telling another person that they, or their idea, is not good enough. What you have described is an outside person supporting Person A’s original idea, and Person A being the one to doubt in themselves. In order to best support another person in encountering their own doubt, there are 2 things that you can do. First, is to listen to them. Second, is to show them support and encouragement for their original decision. It is important here not to make the other party feel guilty if they choose to listen to their doubt. Remember, all of us are in different stages in the personal empowerment process, and while listening and supportive encouragement are always helpful, pushing someone into something before they feel ready for it, can be detrimental to their personal growth.